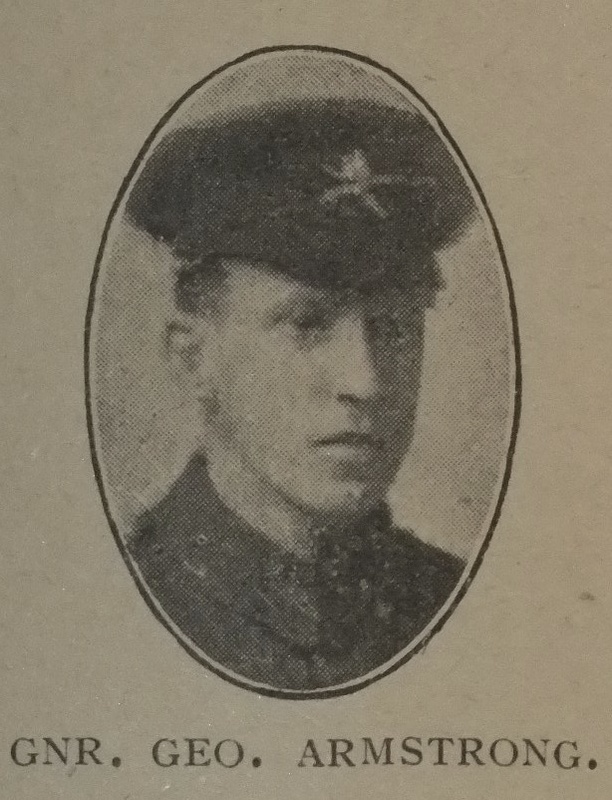 Many hearts were deeply pained when the sad news was received that George Armstrong, junior, had been killed in action in France October 26th, 1917, at the age of nineteen years. After about four months’ training in this country, he was sent to France in connection with a machine gun section. During his eight months abroad he was in several engagements, in the last of which his mortal life was ended. His officers testify to his devotion, ability and courage as a soldier. He was a fine, cheerful, youth, and gave much promise for the coming years. He loved his home, and was deeply interested in our Society at Broughton Moor (Cockermouth Circuit), being a member of the Sunday school, Band of Hope, and C.E. Much sympathy is felt for his family. A memorial service was held at Broughton Moor, November 11th, conducted by Rev. A.J. Bull. George was Private 82408 in the Machine Gun Corps, (Infantry). He was previously 32036 in the Border Regiment.